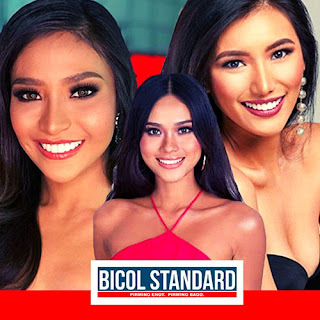 NAGA CITY (Bicol Standard) -- At least three Bicolanas are in the official list of 40 candidates for the Binibining Pilipinas 2019 Pageant: Francia Layderos of Libon, Albay, Sigrid Grace Flores of Panganiban, Catanduanes, and Maria Isabela Galeria of Matnog, Sorsogon. Layderos is a freelance model, Flores is a missionary, while Galeria is a nurse. The list was released last Monday by Binibining Pilipinas Charities, Inc. (BPCI). Winners of the different Binibining Pilipinas crowns are sent as representatives to six international pageants: Miss Universe, Miss International, Miss Supranational, Miss Grand International, Miss Globe, and Miss Intercontinental. It will be recalled that last year, Catriona Gray, also a Bicolana, took home the Binibining Pilipinas crown and went on to become Miss Universe.